Tuesday, April 2 at 2:00 pm in Tech L211: "Gravitational waves: astrophysics, technical challenges and prospects for the future"
Wednesday, April 3 at 4:oo pm in Tech LR3: "The Gamble taken by the NSF with LIGO"
Friday, April 5 at 4:00 pm in Tech Ryan Auditorium: "Exploring the Universe with Gravitational Waves"
RAINER WEISS (NAS) is a Professor Emeritus at Massachusetts Institute of Technology (MIT). Previously Dr. Weiss served as an assistant physics professor at Tufts University and has been an adjunct professor at Louisiana State University since 2001. 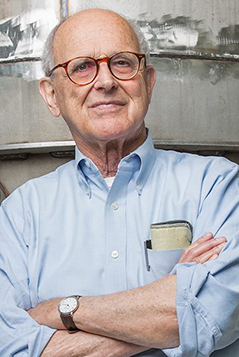 Dr. Weiss is known for his pioneering measurements of the spectrum of the cosmic microwave background radiation, his inventions of the monolithic silicon bolometer and the laser interferometer gravitational wave detector and his roles as a co-founder and an intellectual leader of both the COBE (microwave background) Project and the LIGO (gravitational-wave detection) Project. He has received numerous scientific and group achievement awards from NASA, an MIT excellence in teaching award, the John Simon Guggenheim Memorial Foundation Fellowship, the National Space Club Science Award, the Medaille de l’ADION Observatoire de Nice, the Gruber Cosmology Prize, and the Einstein Prize of the American Physical Society. Dr. Weiss is a fellow of the American Association for the Advancement of Science, the American Physical Society, The American Academy of Arts and Sciences; and he is a member of the American Astronomical Society, the New York Academy of Sciences, and Sigma Xi. He received his B.S. and Ph.D. in physics from MIT. Dr. Weiss is a member of the NAS and has served on nine NRC committees from 1986 to 2007 including the Committee on NASA Astrophysics Performance Assessment; the Panel on Particle, Nuclear, and Gravitational-wave Astrophysics; and the Task Group on Space Astronomy and Astrophysics. To learn more about the Heilborn Lecture and for a list of past Lectures, click here.